“Neopia”, the audio file repeated. What a strange name. Frank gazed out the window, rubbing a finger along the line of his chin. The planet was relatively young, had the right conditions to support life, according to his scanners, and had a few weak signals being broadcasted. All of these conditions, especially the last, pointed to intelligent beings. But if they were so intelligent, where were their space ships? Where were their defense systems, their radars? The signals he had picked up were radio, nothing more. Were the intelligent beings he had hypothesized on still developing? He knew from his studies of the past that intelligent species needed hundreds upon thousands of years to properly develop, but to see it with his own eyes... it wouldn’t hurt to observe these strange creatures for a few days, surely. If they existed at all. He reached out with elegant green fingers to set his spaceship on a course orbiting this planet, this Neopia. The majority of the metal the ship was made of was as black as space itself; there was no reason for any being to see it upon looking up. The technology required to detect the ship at all would be far beyond what a developing species could have made. His ship safe, Frank went off to the docking bay to get his escape ship prepared. This was, Frank thought, a strange world indeed. Creatures- bright creatures, colorful creatures- roamed through this healthy young world without a care. One or two of them noticed him, their sharp young eyes spotting him through the foliage he stood behind, but they exhibited no fear or suspicion at all. This was still an innocent world, then. And he saw another thing, something he had thought he’d never see again. How long had it been, he mused, since he had last seen objects fly through the air with no need for mechanics or magnets? The young faeries that ranged all throughout this Neopia had magic to spare, magic that they shared freely with the creatures who roamed the ground, sea, and sky. He had gathered that the magic was segregated elementally, for the most part, but it was still there in an excess he had never seen before. And that magic would be the reason why Neopia was so low on technology, for no need for it could have arisen yet. Frank rested against his escape ship, thinking. He had landed in a small clearing in the middle of a forest, near a settlement of the creatures, yet none of them, even the ones who had seen him through the trees, had come to ask him questions. They had had no contact from outside their planet before him, obviously. And they were still young enough, as a species, to not know fear of change, to not suspect intruders. Space was not safe, Frank knew. There were beings out there with greedy, self-centered intentions, beings who would take Neopia, strip it of anything valuable, and leave it to rot. And Neopia had neighbors, though as far as Frank knew, the neighbors were friendly enough- a population of strange creatures that called themselves Grundos lived on one planet, a technologically advanced group of Aishas on another. He had already observed the Grundos, and communicated with the Aishas. They would do Neopia no harm if they came upon it. But could the same be said of other beings? He contemplated, and watched as a fire faerie laughed and called one of the creatures to her. She called the creature a Neopet. Frank continued to think as he piloted the escape ship back up to his spaceship. He was a scientist, after all, and thinking was how he did things. He knew the situation he was in was absurd. He had done research in engineering, in biochemistry, in mutation and cloning. He had studied the formations of civilizations before, if only in books. His studies were widespread and intense, and he had developed his mind to have an advantage in logic and intellectualism. Yet here he was, wanting to play the hero. Neopia needed to grow, Frank knew. These creatures, these Neopets, they needed to evolve past their current, childlike personalities, and transform into a more intelligent, adult state of mind. And with the abundant sources of magic making life easy, they wouldn’t grow as a species quickly enough. Yes, he decided, Neopia needed a challenge. And he would need to be the one to give it to them. Once he had landed back inside his ship, he set to work. He had done most of his research in cloning, and had all of the tools he needed right at hand. Two days he spent in the lab, working, while his ship orbited Neopia. He ate from the packaged food kept there; he didn’t sleep at all. When he walked out of the lab at the end of the two days, there were two of him. To be sure, Frank thought as he watched his clone out of the corner of his eye, cloning was still a tricky business, and it still didn’t work perfectly. His clone was far more simple-minded than he was. The clone’s green skin sagged, and he refused to change his black lab coat for different, more suitable clothing. The clone seemed prone to bragging, though his intelligence was mediocre at best. He would be perfect for Frank’s plan. Frank observed his clone’s actions. The second Frank accessed the ship’s computers once he thought his maker was not paying attention, and had soon brought up all of the files Frank had saved on the planets nearby. The clone seemed particularly delighted with the Grundos, and disgusted with the Neopets. As soon as he had a chance, the clone stole several of Frank’s weapons, loaded them onto the largest escape ship, a giant, circular red thing, and took off for the Grundo’s planet. Frank watched through security cameras installed in the escape ship as his clone landed stark in the middle of the Grundo colony, taking the terrified creatures hostage. He had to admit that his clone had at least some brainpower as the self-proclaimed ‘evil mastermind’ used mutation rays to transform the peaceable Grundos into giant monsters, ready to do as he bid. He watched as various Grundos attempted to rebel, and were beaten down by their mutant peers. He watched as his clone, in an unusually brilliant stroke, managed to capture an unusually colored faerie, locking her up in the ship’s control room. Frank considered contacting the faerie, but eventually decided not to. He didn’t want anyone asking too many questions when the fate of Neopia was yet to be decided, and his part in this plot could not be found out. He kept a careful eye on his clone throughout the entire war, making sure that no significant harm was done to any of the inhabitants. 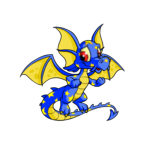 He went back down to Neopia once, being more careful to hide this time, and saw that the Neopets had realized there were such things as enemies. They were doing whatever they could to help the Grundos, and to assist the person they called the Space Faerie, who had apparently contacted them to begin with. And when the time came, Frank hacked into the other ship’s mainframe and froze the mutation ray. With the ray frozen, the Space Faerie’s magic did its job, and it was destroyed. Frank could only assume that his clone fled in one of the ship’s escape pods, to find another, less contradictory planet to attack. His job was done. The Grundos in the ship would soon discover the various small spacecraft contained within, and with those methods of travel and the Space Faerie to help, they would be able to reach Neopia. The threat that his clone had posed would live on in the minds of the Neopets, and they would be more prepared, better equipped, if a worse enemy ever came along. They would learn to defend themselves in time. Frank stared out of his control room’s window, observing the planet below. He had involved himself enough in this strange planet’s history, and it was time to move on, before he was discovered. He had other civilizations to find, more research to do, and time was precious indeed. With a small smile, Frank put his fingers on his computer’s keyboard, ready to set his next coordinates. There was an escape pod outside, slowly floating through space, past his ship. It had his ship’s style; it had to be from his defeated clone’s ship, then. It was drifting away from Neopia, and there was no telling where it would end up eventually. He turned to the ship’s computer, and typed in the code for the tractor beam. The pod began to speed towards the docking bay as the large metal entrance opened, and Frank walked down to meet it there. It landed inside, the large metal doors closed, and Frank walked up to the escape pod. It seemed to be empty, as the door hadn’t opened. Frank sighed and tapped the appropriate code into the control pad next to the pod’s door, wondering if it had been sent out by accident. The door swung open, and Frank found a very young Split Grundo pointing a laser gun at him. The Grundo was huddled into the corner of the seat and shaking visibly, his orange spacesuit torn and dirty. His forehead had recently been cut twice, leaving an x-shaped gash between his eyes, and it was apparent that he had cried a great deal recently. But there was a determined light in his eyes, and if the hand that held the gun shook, it still kept the weapon pointed directly at Frank. Frank thought for a moment. For obvious reasons, this Grundo thought that he was the Dr. Sloth who had enslaved the Grundos. But that guise wouldn’t do at all. “Why should I want to kill you?” he asked, his voice mildly interested. The Grundo hesitated before lowering his gun an inch or two. “Parlax,” he said, still suspicious. Frank looked the Grundo over more carefully. He was young, yes, but the young learned more quickly. More importantly, this Parlax had apparently been frightened of Dr. Sloth, and had been recently hurt. That left the possibility that his clone was still out there on the ship, seeking revenge... and he couldn’t very well leave a planet with his evil-mastermind-clone still running around. It wouldn’t be responsible. He’d have to bide his time, then- and in the meantime, he might teach this young Grundo a thing or two.